August 2011 – Go. Find. I kept waiting for his eyes to open and his smile to reappear. I had never seen Fr. George without that smile–like there was a big joke he couldn’t wait to let me in on. But he remained still inside that coffin and the hand which was so warm the dozens of times I kissed it after services was cold when I said goodbye. But the beauty of my faith, the belief in the THERE that is not here and yet so close, tells me that Fr. George sang the Thrice-Holy hymn with us this morning. I know he will participate in that ongoing work that occurs in heaven, the one we haltingly try to join into here. That thin veil between life and death, between the temporal and the eternal, broken in just an instant, does not keep THERE always out of here. It seeps through, oozing into our lives in ways we could never imagine. It calls to us. It beckons us. It reminds us that this is not all that we are. That we are more, meant for more and will be more. Fr. George (the man formerly known as William M. Smith) is now more. He is now that which he was always meant to be (though I think he got closer to it here than most people). Our hearts mourn him but we rejoice too in knowing that he will find rest in the place where the saints repose. I made it through much of the memorial service Monday night without tears, but when we got to the part of the service, a part common to all our services, in which we sing so beautifully “Lord, have mercy. Lord, have mercy. Lord, have mercy. Father, bless!” We ask our father, this one who has committed to guiding us and shepherding us through to THERE, to pray for us one last time in the service. I broke down completely as I thought about how I will miss seeking Fr. George’s blessings and his advice. I was so sad. But then today, as we sang the Liturgy and then the funeral, I was reminded throughout of how he’s not gone so much as just THERE. But he will still, I am sure, ask God to bless us. He will still serve, albeit THERE, alongside the saints, and all the angels, in the mystical supper always served in the high places. This week started off with that glorious day at Holy Dormition Monastery. But it wrapped up with a dreaded, but not surprising, email announcing the death of the beloved Fr. George Smith. A few weeks ago, while I was on vacation and standing next to my mom and grandma in St. Mary’s Orthodox Church in Goshen, Fr. Matthew announced Fr. George had taken a turn for the worse–his cancer had returned and he was becoming very ill very quickly. I made up my mind to send him a note, thanking him for all he had done for me personally. I bought the card on Wednesday. He died Thursday night. I never got to tell him how much he meant to me. And the news of his death hit me harder than I thought it would yesterday, making me much more upset and irritable than I know Fr. George would have liked. But I’ll do better with it today and I am going to tell you why that wonderful little priest meant so much to me and to nearly every Orthodox Christian in the northern half of the state. Fr. George had a wonderful career prior to becoming a priest. He retired from the Fort Wayne Police Department, after years as an officer and bomb technician. I am sure that his friendly and unflappable personality served him well in both of those tasks. His wife, Charlotte, is equally warm, and in contrast to someone like me, has never been known to say a cross word about anyone or anything. Fr. 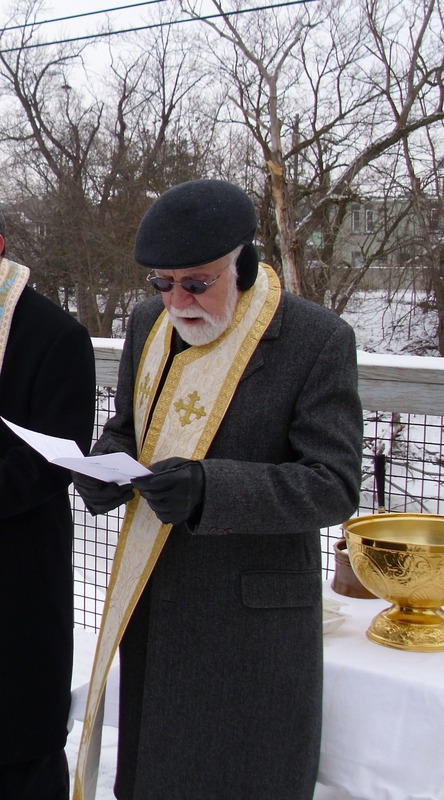 George never had his own parish, instead being content to serve as a “supply priest” for the Antiochian Orthodox Church’s Midwest Diocese. He attended, officially, St. John Chrysostom’s, which was where I first attended and later joined. He was one of the founding members of St. Mary’s before that. He was at St. John’s when it fell apart, less than a year after my chrismation. When my friends and fellow parishioners scattered to the wind, some moving and others starting their own “orthodox” church, Fr. George and Charlotte worried about what would become of me. I too left the church, even not attending anywhere for a few months. I eventually wandered into the Greek church, out of some unfounded fear of the then-priest at St. Nicholas and his reaction to the split at St. John’s. Nearly two years later I drug myself to a Theophany service on a snowy bridge over the lunch hour. 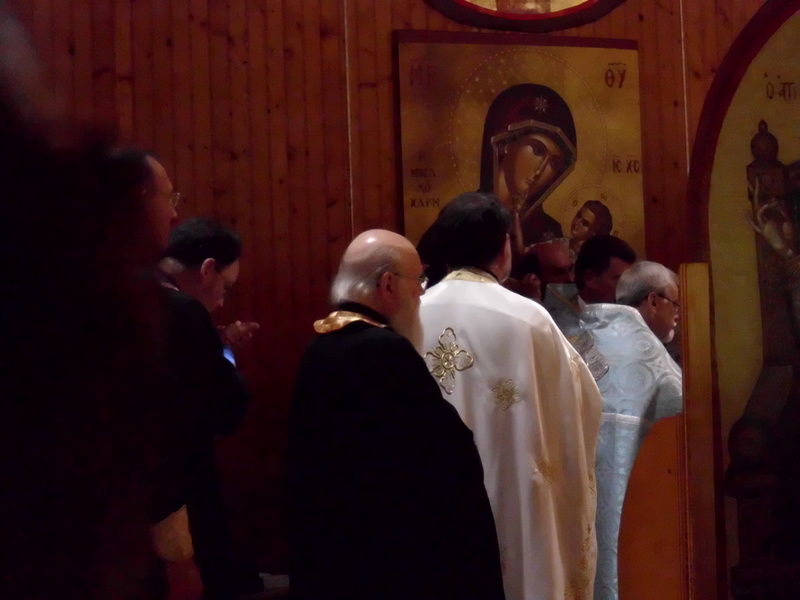 I had grown weary with life at the Greek-language Holy Trinity Church, finding it hard to connect with the service and the people. There, standing in the snow, in his vestments and earmuffs was Fr. George. Both he and Charlotte wrapped their arms around me, giving me a huge hug. We’ve been praying for you for these past years. We worried you would leave Orthodoxy because of what happened. You were so new to the faith. I nearly did, I told them. But I just couldn’t. Oh, my dear, we have just prayed so much for you, they said again. You should go to St. Nicholas where they speak English. It will be OK.
For some reason, whenever Fr. George said it would be OK, I always believed him. Normally, when people tell me something is going to be OK, I believe the exact opposite will be the case. I took their advice and went to St. Nicholas, which unbeknownst to me was in the midst of its own “unpleasantness.” About 18 months later, the priest there left to go back into the military full time as a chaplain and my beloved Fr. George served as our priest for a year until Fr. Andrew came. Fr. George was never the most polished priest, and never was he showy. He quietly served the Liturgy, giving simple homilies and practical advice during confessions. There was that one time he set the carpet on fire during Pascha with the incense, but that was an outlier. He fit well in our altar, looking just like the icon of St. Nicholas mounted in the front of our church. And whenever I saw him up there, I always felt so spiritually safe. I always believed it would be OK. Anytime I heard his voice lifted in prayer, I always knew I, and all his other little sheep, were on his mind and heart as he spoke to our Lord. I will miss him so much–his twinkling eyes and quick laugh. But I know, and this is reason #129 why I love Orthodoxy, that his prayers for me will continue now as he has gone just beyond that thin veil that separates “here” from “THERE.” I will light a candle for him on Sunday, and probably a few other candles in the weeks and months ahead. I will ask God to take good care of His faithful servant, the Archpriest Geroge, because he meant so much to us here and we will miss him. May He grant him rest where the saints repose. I know that his legacy, his faithful work, continues on here. It continues on in me every time I come into church. It continues in my sister and her husband, Orthodox now three years. That would have been less likely to happen had I grown frustrated and left the faith. It continues now with my mother and grandmother, singing and praying at St. Mary’s, a church he helped to found. Vechnya Pamnyat! May his memory be eternal! Totally had the best day yesterday and, in a mere 11 hours, succeeded in doing what a full week of vacation could not do for me. A day at the Holy Dormition Monastery for the Feast of the Dormition of Mary apparently was what I needed to turn. my. brain. off. I walked the grounds, swatting mosquitoes in the woods. I took my shoes off while I watched the chickens pecking the dirt. I took pictures of the little kids playing in the garden the nuns made for them. We ate a simple lunch on tables set among the trees. On the trip home, I road back with Roza, a Macedonian immigrant via Albania. She remembers when the communists tore down her village church. She bakes the bread a lot for Communion on Sundays, but her story and the passion with which she shared it, well, that was communion of another kind. All of this was Communion. Sacramental. Sharing. Working in common. It sure beat criminal court. This morning, while rushing out of my fave coffee shop to get to the newsroom, I literally ran into a woman I hadn’t seen in about five years. Funny thing, this. Back in the day, a long, long time ago, we were really good friends, the best of friends. But “whatever” happened and we stopped speaking, other people around us stopped speaking and it was a big ugly mess. Oddly, we’ve never run into each other except one other time in the decade since we stopped speaking to each other. That in itself is kind of strange because, let’s be honest, this city ain’t that big. There’s only so many sushi places, so many good coffee shops and only one decent Indian restaurant. I’d always figured when, or if, I ran into her, I wouldn’t have a ton to say. Hurt feelings are like that. But when the door to the coffee shop opened, all I thought was, wow, I haven’t seen her in a long time. And it’s kind of good to see her again. We talked for about 30 minutes. It was a good talk. Grownups can do that, I guess. We laughed. We shared pertinent family details. Her father has since died and that makes me sad because I always liked her dad. She was happy to hear of my sisters lives and my continued employment in the shaky world of newspapering. I realized as I walked away, in one of those now-shortened-skirts, that her daughter, now about 12, had pooped all over that skirt when she was just a couple days old. An attempt to get the stain out lightened the skirt a bit, but over the years of washing, the skirt faded up a bit and now it’s indiscernible. Now the skirt is shorter, the stain is less noticeable and I”m a few pounds lighter in personal baggage. I’m not sure if I’ll run into her again, but it was good to do so today. It was like finishing a sentence or the last measure of a song. It would have been wrong to just tuck the whole thing in the closet without an update, or at least pulling it out again and trying it on a new day. I really wanted to blog tonight, maybe write about the lecture I got from the sparrow the other day (seriously, it happened), maybe my frustration at not being able to run for the past two weeks and how trapped that made me feel, or about why I believe good Christian folk should not watch FOX or listen to Rush on moral grounds. This morning, I did get a letter from an anonymous somebody (I have some suspicions) that contained $50 in cash with carefully-printed instructions to stash it away for the next person that shows up at my door looking for work. The mail carrier comes early in my neighborhood, so she put it in my hand as I was heading to my job. I carried it back inside with tears in my eyes. I need to find a good place for it so I don’t forget about it. I will say a prayer, too, that the man will come back soon. Maybe my grass will grow or something so I have some work to offer him. Someone helped me help him. Pretty cool, huh? So I guess I do have something to say. A man just knocked on my door. He was neatly dressed, appropriately groomed and riding a bicycle. He politely asked me for the privilege of trimming the yard and the bushes. He’s out of work and this is how he’s living. My heart broke as I told him that I didn’t even have the money to pay him. Right before he appeared on my porch, I checked my bank balance online and saw again that my expenses are barely (and sometimes not) covered by the wages paid by my employer, cut 6% a couple of years ago and made smaller by rising insurance costs (for less coverage of course). They no longer contribute to my 401K and right after I became vested, cancelled the pension. I have no flexible spending account. But I do have a job. And a brain. And that brain tells me that our country is absolutely doomed. While this poor man is knocking on doors to try to mow grass in a drought (my grass hasn’t been mowed nor has it grown since early June), our “elected representatives” have decided to take the rest of the summer off, so exhausted are they by the last month of silliness. While they rest up, the unemployment rate sits at 9.2 percent, more than 47 million Americans lack health insurance (which in this country means they don’t have access to care), and we’re laying off our police and firefighters or cutting the retirement benefits we said we’d cover for them after years of hauling hose or wrestling violent criminals to the ground. Yesterday I had a phone conversation with a friend/source (it happens and is hard to avoid) about politics. She’s a Republican so we’ll call her “R”. She is mad about the debt ceiling, worrying about entitlements and the need to cut government spending and size (and yes, like most of my friends who feel this way, she is a public employee). R admitted rather sheepishly that she gets most of her news from FOX (which will be another blog post, count on it). 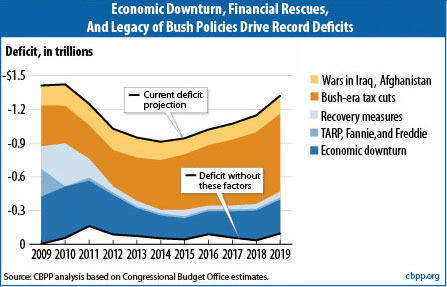 I explained to her that, yes, Obama has increased the budget deficit, but he did so by honestly putting the wars on the budget, as well as Bush’s disastrous Medicare PartD program and those nonsensical tax cuts. R: You’re telling me you’d pay higher taxes? Me: Maybe. But I do want my insurance costs to be lower because we have a good fire department. I don’t want my grandmother eating cat food. I want child abuse prevention money. And I hate potholes in my roads. God forbid we help each other out. God forbid we look out for anybody but our own damn selves. The past decade has seen the income gap grow to absolutely obscene levels. What we have now is hoarding on the corporate level, and it is just as ugly and unhealthy as if these clowns were keeping a thousand cats in their kitchen. It’s dangerous and it’s killing us. Those tax cuts did not give us better employment rates. That money’s not trickling down. My boyfriend (the cop) hasn’t had a raise in years. Our roads are falling apart. This summer of record heat, the poor have had no money to help pay their electric bills, so they’re literally DYING from the lack of funds. The state is cutting child abuse prevention programs because there’s no money to pay for them. And this morning, a really nice, but sad, man knocked on my door, asking for a scrap of work. I hope I didn’t damage his dignity, that image of God given to him, by being unable to help. I’m going to stash away $20 for the next time someone comes looking for work. It’s happened three times already this summer. I anticipate lots of leaf raking offers as well.